Over the years Colombia has provided exceptional soccer teams, both domestic and national, and a plethora of gifted players. Colombian soccer has fascinated fans around the world, from the early years of Colombia's national soccer league in the 1940s and 50s when many of the best players in the world plied their trade at Colombia's clubs, through the drug cartel influenced 80s, to the glory years of the Colombian national team in the 90s. In 2011, Colombia successfully hosted the FIFA Under 20 World Cup for the first time. The Colombian Under 20 side reached the quarter finals of the tournament which was won by Brazil. What follows is an in-depth look at Colombian soccer's colourful history. Although some clubs have existed since as far back as 1913, a Colombian soccer league was not formed until 1948. Following a dispute with FIFA the Colombian Football League spent its early years outside FIFA with its clubs and national team suspended from international football. This occured at the same time as a players strike in Argentina which meant that many top Argentinan footballers moved to Colombian teams attracted by higher salaries resulting from a strong Colombian Peso. Even Alfredo di Stefano, one of the greatest players of all time, played 4 seasons in Colombia. Bogota club Millonarios (for whom Alfredo di Stefano played) in particular were able to form a star-studded squad which for several years competed with the best clubs in Europe including famous victories against Real Madrid at the Santiago Bernabeu stadium in Madrid. The Colombian soccer federation eventually rejoined FIFA, the Argentine football strike ended and Colombia's economy lost much of its strength as the country fell into what was known as "La Violencia". Colombian soccer, now unable to attract soccer players of the same ilk as di Stefano would never again see the same level of talent and glory. The 50s and 60s had been dominated by Millonarios, but during the 70s teams such as Atletico Nacional (from Medellin), Deportivo Cali (from Cali), Independiente Santa Fe (from Bogota) and Atletico Junior (from Barranquilla) emerged as pretenders to challenge for Millonarios' crown as soccer kings of Colombia. 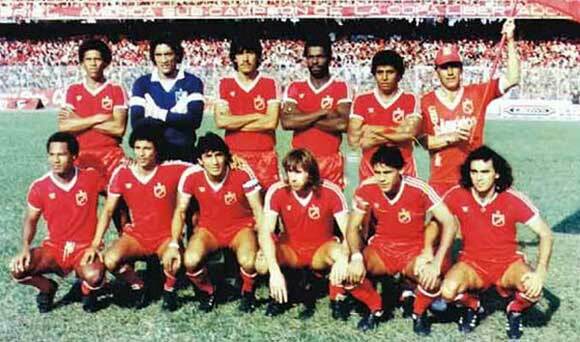 However, in the final season of the 70s a team called America de Cali claimed the league championship. It would be the "Red Devils" of Cali that would dominate the next decade in Colombian soccer and usher in a darker side to the game. Bank-rolled by the Orejuela brothers of the Cali drug cartel America de Cali contracted numerous stars, principally from Argentina. At one point there was even talk of one Diego Armando Maradona moving to America de Cali. With a squad full of the likes of Juan Manuel Battaglia and Willington Ortiz America de Cali won 5 consecutive championships during the 80s (from 1982 to 1986). America also appeared in 3 Copa Libertadores finals during the 80s (South America's version of the Champion's League), but incredibly lost all 3 finals. While the Orejuela brothers were pumping illicit money into America de Cali, Pablo Escobar was busy doing the same thing at Atletico Nacional, as was Jose Gonzalo Gacha at Millonarios. However, the support of the drug cartels was not only financial. They also used violence to intimidate opposing teams and referees. During the 1989 season a referee was assassinated and the Colombian soccer federation took the decision to cancel the season. 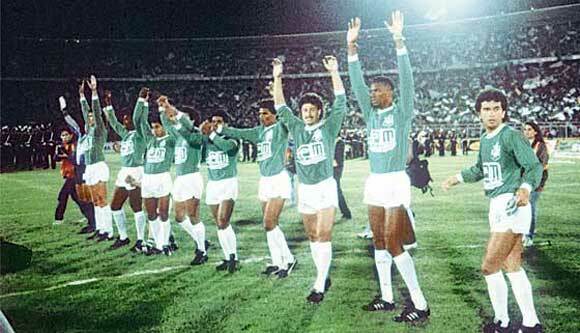 Despite the suspension of the domestic Colombian soccer season Atletico Nacional became the first Colombian team to win the Copa Libertadores. Atletico Nacional defeated Olimpia of Paraguay in the final which was played at El Campin stadium in Bogota as their own stadium, El Atanasio Giradot, had been closed due to Atletico Nacional's suspected involvement in the assassination of the Colombian referee. Whereas the 50s and 60s had been golden eras for Colombia's domestic soccer, during the 90s it was the turn of Colombia's national team. With quality of the likes of Rene Higuita, Carlos Valderama, Faustino Asprilla, Freddy Rincon and Andres Escobar Colombia reached all 3 World Cups during the 90s. In 1990 they successfully negotiated the group stage of the tournament only to lose to Cameroun in the 2nd round following an infamous error from eccentric goalkeeper Rene Higuita. 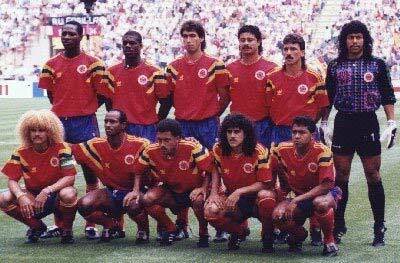 Despite the disappointment of 1990 the Colombian national team went from strength to strength. They easily qualified for the 1994 World Cup during a campaign which included an extraordinary 5-0 victory over the mighty Argentina in Buenos Aires. This victory, along with their attractive brand of passing football, brought them huge praise. Among those dishing out the plaudits was Pele who famously predicted Colombia to win the 1994 World Cup. In the end the 1994 World Cup would become the lowest point in the Colombian soccer team's history. After so much promise Colombia flopped. They lost their first game 3-1 to Romania followed by a 2-1 defeat to USA , the first of the American goals an own goal scored by Colombian defender Andres Escobar. A 2-0 victory over Switzerland in the last game was too little too late. Colombia finished bottom of Group A.
Colombia returned to home to immense disappointment. However, disappointment would soon be replaced by tragedy and shame. On the night of 2 July 1994 Colombian defender Andres Escobar, scorer of the now infamous own goal, was assassinated outside a nightclub in Medellin. The killer apparently shouting "Gol" with each shot fired. The news travelled around the world and cemented Colombia's image as a violent, lawless place. Colombia again qualified for the 1998 World Cup, but many of their most influential players were past their prime, retired, or in the tragic case of Andres Escobar, deceased, and they once again failed to progress from the group phase. It would be Colombia's last World Cup for some time: they did not qualify for any of the World Cups the following decade. Colombia's new breed of young talent will be hoping to put that right in the 2014 World Cup in Brazil.